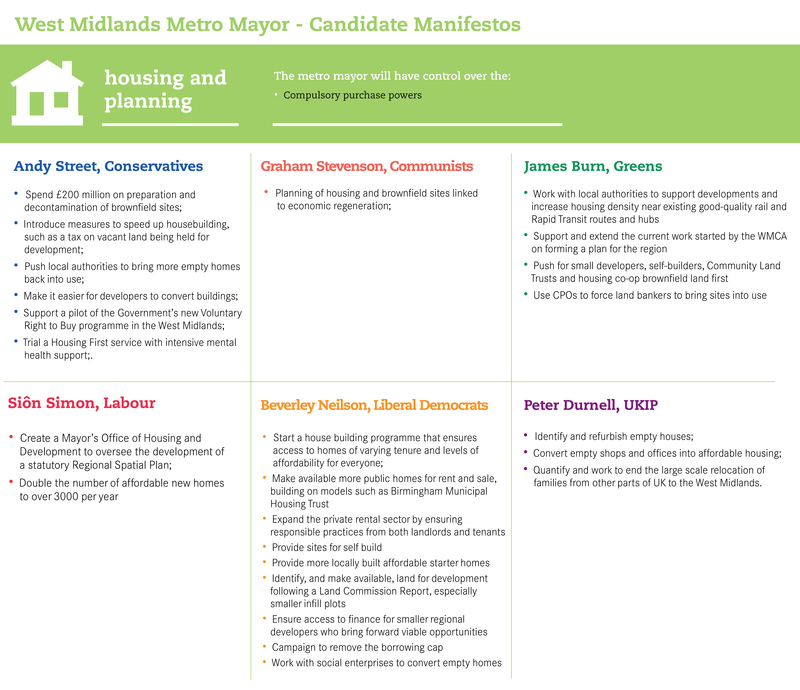 Both the polls and recent voting patterns point to the West Midlands metro mayor election being a close run race, and accordingly candidates have set out some of the most comprehensive manifestos of all the places electing a mayor. But while all the manifestos refer to the important new powers of office, the strategic plans they set out vary from candidate to candidate. Skills and education are front and centre of all the manifestos. This is welcome, as our research shows that the West Midlands’ very low employment rate (only 65 per cent of residents have a job compared with 74 per cent nationally) should be the metro mayor’s focus, and improving skills levels is crucial in helping people access jobs. To address this issue, all the candidates have focused on ensuring that skills-provision better meets the needs of local businesses. Both Siôn Simon (Labour) and Andy Street (Conservatives) – the front runners in the polling – have called for a specific focus on digital skills, while Beverley Nielsen (Liberal Democrats) has highlighted the need to focus on meeting the labour needs of the construction industry in the city region (as has Street). James Burn (Green Party) says he will champion small and medium-sized businesses and social enterprises, and will focus on improving adult education and careers advice to improve skills-levels among people of all ages. Both Nielsen and Street are also calling for graduate retention policies to target high-skilled workers. However, as our research demonstrates, increasing the number and quality of high skilled jobs should be the focus for city policy makers, rather than relying on narrower policies that target graduate retention. Improving transport in the area will also be a priority for the new metro mayor, to better link people with employment opportunities across the city region and to demonstrate to local constituents what impact the metro mayor can have for them. As such, there is agreement among the candidates on the need to expand transportation options around the city region. 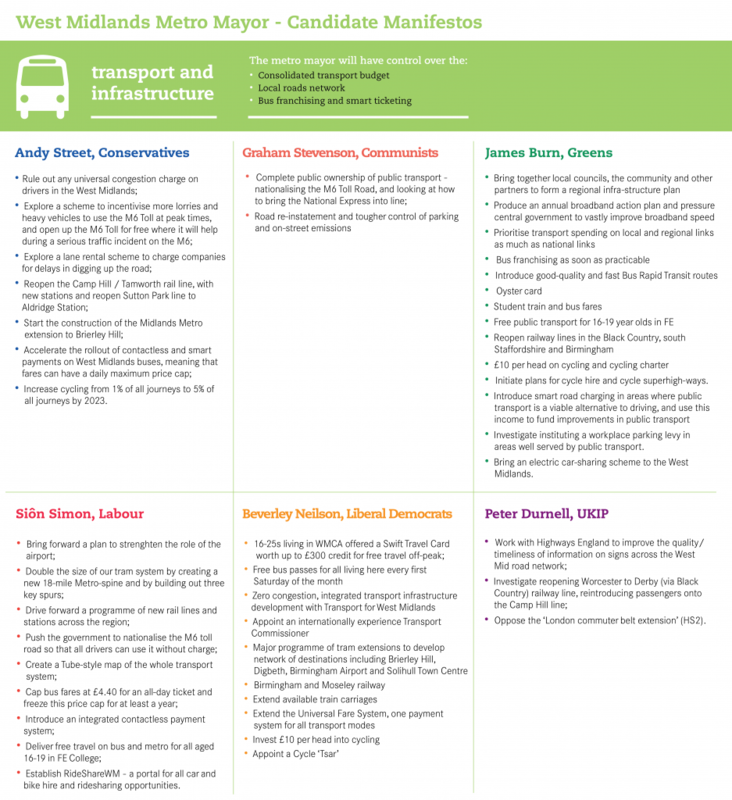 Siôn Simon, Beverley Nielsen and Andy Street have all proposed expanding the tram system, while Pete Durnell (UKIP), Beverley Nielsen and James Burn plan to extend the local rail network. Siôn Simon has also pledged to cap bus fares at £4.40 a day, a striking policy which could act as an effective ‘quick win’ if he is elected. However, his promise to abolish the M6 toll road charge would require significant funding. All the candidates call for more affordable housing measures. This varies from a commitment to double the number of affordable homes from Siôn Simon, to a focus on brownfield land remediation from Andy Street, and plans for a land commission from Beverley Nielsen. The latter and James Burn also call for measures to help smaller developers, for example by bringing forward smaller plot sizes for new homes. Homes across the city region are more affordable than the national average, but remain more than seven times more than local incomes. This also hides some local variation, with homes in Solihull homes more than 11 times local income, whereas in Sandwell prices are nearly seven time higher than wages. The candidates have been wary of publishing exact targets for house building, but they will have to make these tricky decisions if elected. The new mayor will also have to make full use of their strategic powers across the city region to ensure new housing developments are planned in conjunction with other infrastructure such as transport. Watch this space for more analysis on the metro mayor manifestos in other city regions in the coming days.